Browsing through the Legistar system (at http://a2gov.legistar.com) is intended to be straightforward, if not exactly easy. 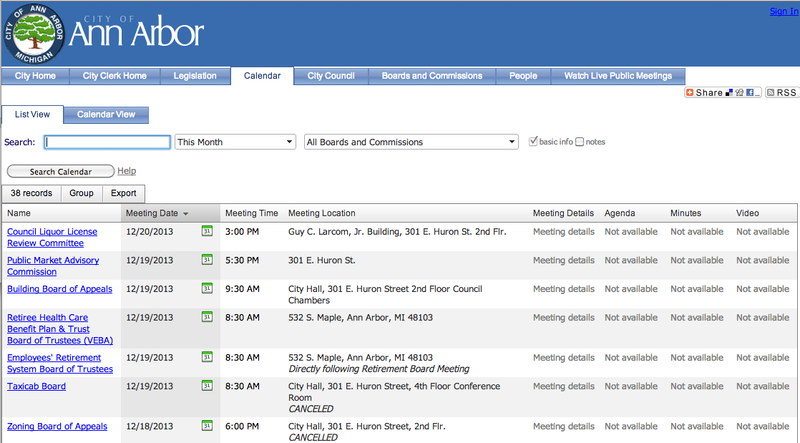 The "Calendar" page is a good place to start; it shows you a nice list of all* of the boards and commissions in the city that are meeting at the time period that you choose (like this week or this month) with handy links to some of them when an agenda is posted. 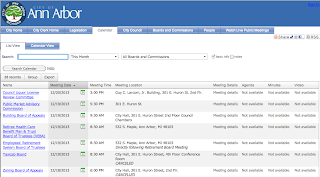 If you are really lucky, like if you are interested in Ann Arbor City Council, past meetings will have video links with the video sessions synchronized near about to the time when council members were talking. It's possible to rewind time back to the council meeting and replay what was on the camera - if you know which meeting a certain event took place at, and if the camera was running at the time. When I say all* boards and commissions, I really mean "some boards and commissions". For reasons that I don't completely understand, only a fraction of the city departments actually use the Legistar system for their meeting minutes, and not every public meeting is posted in its calendar. That creates some confusion for searching. and you'll get all of the Traffic related ordinances dating back to 2007 or so. Now you might need to poke around a bit to get to the place you want, but at least you have a start at a search strategy with predictable results! A caveat is in order. At the present time, this search approach does not go deep into the contents of attached PDF files on the Legistar system. I don't know how to get to the innards of those files with any search. That's something that is probably within the power of only the City of Ann Arbor and its vendor to fix. Remember that any complete search for records also should search the main city site, a2gov.org, to be complete; use a similar search strategy there. Google Advanced Search can be your friend.